The Suspicious Activity Report form, administered by the Office of Attorney General, provides an easy way for people to report fraudulent, stolen or altered prescriptions, or a suspicious doctor/pharmacy. 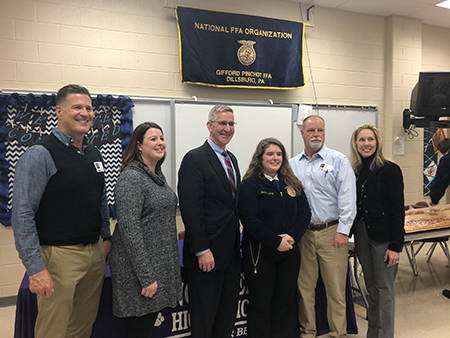 Sen. Mike Regan (R-York) and Secretary of Agriculture Russell Redding joined me for a meeting with FFA members at Northern High School. I had a great time learning more about how the program is preparing our future farmers for the real world. Congrats to Garrett Benson on achieving the rank of Eagle Scout. 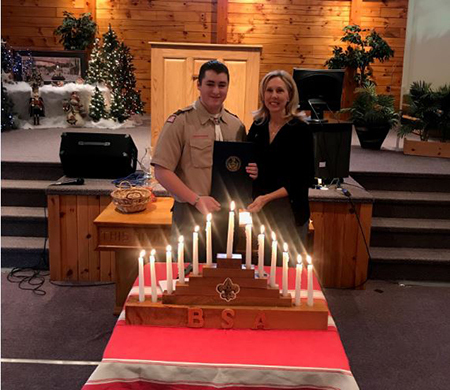 Garret, of Troop 38, built a playground at Crossroads Bible Church in Dillsburg for his Eagle Scout project. This a great project that will see a lot of use. Way to go, Garrett! The symptoms of heart disease can be different in women vs. men and are often misunderstood. By increasing awareness, speaking up about heart disease and empowering women to reduce their risk for cardiovascular disease, we can save thousands of lives each year. You can learn more about the symptoms of a heart attack and what to do by clicking here. The York County Solid Waste Authority disposed of a total of 4.15 tons of unused and expired residential medication collected via the authority’s Secure Medication Take-back Box Program, community drug take-back events and illegal drugs delivered by law enforcement for destruction. Every pill dropped off at a secure box is one less drug that will find its way on to the streets, or into the hands of our youth. To help keep prescription medications out of the hands of those who shouldn’t have them, 17 York County police departments partnered with the authority to host medication take-back programs. Responsibly disposing of drugs is a matter of public safety and is a simple way to combat the opioid epidemic. Unused drugs can be stolen from homes or taken by people not prescribed to use the medication. Drugs tossed into the trash or flushed down a toilet can contaminate our water supply. Carroll Township Police Department, 555 Chestnut Grove Road, Dillsburg. Open Monday through Friday, 8:30 a.m. to 4:30 p.m.
Newberry Township Police Department, 1905 Old Trail Road, Etters. Open Monday through Friday from 8:30 a.m. to 4:30 p.m.
Northern York County Regional Police Department, 1445 East Canal Road, Dover. Open Monday through Friday, 8 a.m. to 4:30 p.m.